I hope you had a most excellent weekend! Did you do anything fun or relaxing? The highlight of our weekend was attending our food group that was centered all around Thanksgiving -- I guess we are spoiled this year to indulge in two turkey dinners. 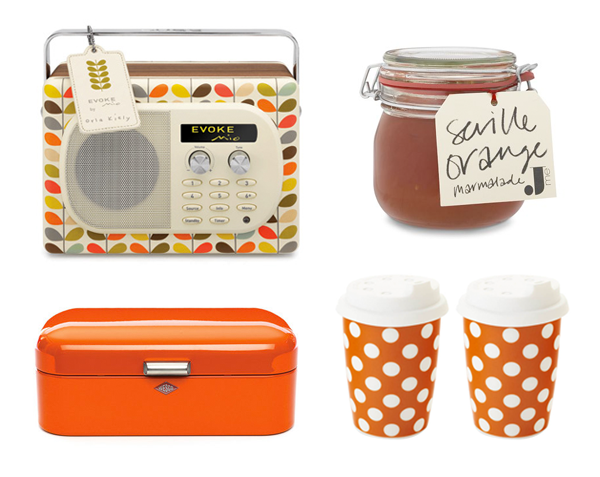 These items all put together are making me happy and feel so autumn-like this morning. Pause and take a moment with me to enjoy ... pretend to turn on some tunes on that sweet Orla Kiely Radio, maybe something classic like Al Green. Get some yummy crust bread out of that bread bin and slather it with orange marmalade. Then indulge in some spiced hot apple cider or your drink of choice in one of those polka-dot travel mugs all while doing whatever it is you do this lovely Monday. Top of the morning to you! Love the radio. Anything orange really! oooo orange, the color of fall! so lovely! i hope you guys have a great thanksgiving! can't believe it's coming up so fast. we've already had ours up here in canada, so i can already tell you, it's a good one. ha. I love all the fun colors of this post. I'm a fan of turkey so two turkey indulgences sounds pretty awesome. Ohhh! I just love the polka dots! So great!! Love these items, they've got a funny mood! crazy about the polka dot mugs! They are so unique and fun! Thanks for sharing! Love your blog. This is such a fun event! I love the colors and details!